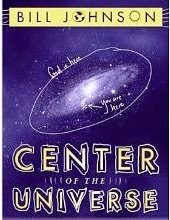 Center of the Universe—A Look at Life From the Lighter Side are slices of life from a pastor to his congregation that mixes real concern with real humor. From tales about fly-fishing and an uncontrollable hunting dog to a revival in Africa and healing the homeless, this compilation of 93 stories brings smiles as well as profound insight. With a very casual style and voice, the author relates directly with the reader as a personal friend, committed to sharing valuable lessons he learned on the lighter side of life. I love how Bill Johnson's marries the every day and the supernatural flawlessly and honestly; just like it should be. This book is great for anyone no matter what they believe. I put it in my guest room when I have people over and am surely giving it to my brother-in-law for his birthday. So funny, and real, and sure to plant seeds of faith.